SpatiaLABS 2013 complements Esri's Educational Site License program for universities. Designed for disciplines across the entire university, SpatiaLABS 2013 Edition complements and enhances an instructor's course with geospatial investigations. The computer-based lab sessions, published by Esri Press, build students' spatial reasoning and analysis skills. SpatiaLABS 2013 Edition presents problems or topics to investigate, such as Impacts of Sea Level Rise and Storms on Manhattan, Customer Profiling: Demographic and Lifestyle Segmentation, Evaluating Maple Sap Production Potential, and High School Dropouts: The Effect of Neighborhood Characteristics. Then students use geographic information system (GIS) tools—which provide analytic capabilities to question, interpret, and visualize data—to reveal patterns and relationships. Students develop GIS and cartography skills along the way; however, the primary focus is teaching students how to approach and solve geospatial problems. The SpatiaLABS collection has grown in number to 64 lessons since its first release in 2012, and all lessons are compatible with Esri's ArcGIS software. In addition, these lessons complement Esri's Educational Site License program, which provides geospatial software and training to colleges and universities. Topics span many subjects of interest to students in the physical, social, and applied sciences. And although each has been written with skill prerequisites in mind—from no GIS exposure to advanced projects—SpatiaLABS are customizable, so educators can make them more or less challenging. Delivered on DVD, the lessons are uploaded to the school's server to allow access by all campus faculty. Each instructor can then download the lessons—which are provided in editable file formats—and easily customize each lesson, if desired. 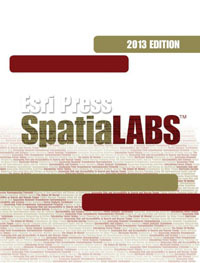 SpatiaLABS 2013 Edition is available for an annual license fee. To learn more and to order, visit esri.com/spatialabs or call 1-800-447-9778. Outside the United States, visit esri.com/offices to contact your local Esri distributor.